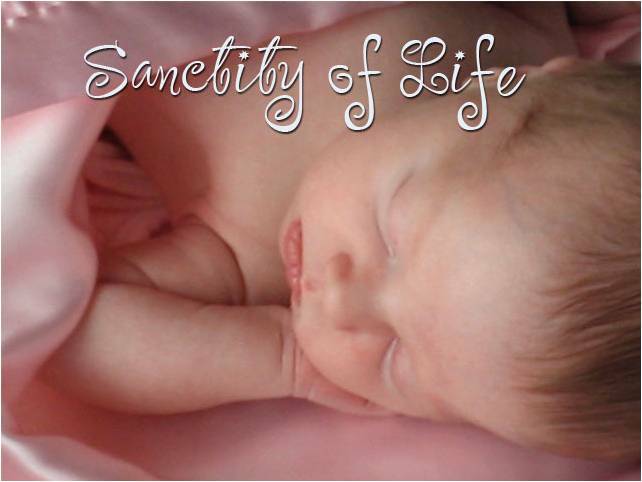 Sanctity of Human Life Sunday is January 22, 2012. This year, the anniversary of the landmark “Roe v. Wade” Supreme Court Case (Jan. 22, 1973) falls on a Sunday. Therefore human life, which is conceived in a miraculous way that science can only barely begin to explain, is to be celebrated and protected. Furthermore, the love of a mother and father is to be honored and respected as forming the cradle that nurtures the health and well being of a child. In all this, God is worshipped and praised as the Creator and Sustainer of Life. In the church we choose to talk about the Sanctity of Life in the month of January in particular because on January 22, 1973, the U.S. Supreme Court ruled that it was unconstitutional for states to prohibit abortion in the first trimester of pregnancy. That case then opened the way to what we observe today: In America, 1,600,000 babies are aborted every year. That works out to 4,383 per day or 183 per hour! Along with the millions of lives lost, there are also millions of women and fathers that have suffered the effects that follow an abortion. Our heart grieves for them too. May we as Christians celebrate and champion the protection of human life as given by God. And may we remember and support those women and men that are raising children or are mourning ones that have died. Prayer: Father, thank you for giving us life! Thank you for creating us in your image! We lift up to you parents that are caring for children – may you give them the blessings and grace they need to raise their children according to your will. And we also lift up to you women and men who have chosen abortion as a solution. Give them comfort and peace as well as assurance of your mighty love. Lord, forgive us for not respecting life as yours alone to give and yours alone to take. In your Holy Name, we pray. Amen.